Preserving natural teeth is a major goal of modern dentistry. But when a tooth is not salvageable and needs to be removed, it is now possible in many cases to replace it immediately with a dental implant. A dental implant is a small titanium post that substitutes for the root part of a natural tooth. A dental crown is attached to the implant, making the whole tooth-replacement system look and feel just like your own. Implants are used in a variety of situations: to replace a single tooth, multiple missing teeth, or even an entire set of teeth. It used to be that if you were having failing teeth removed, there would be a wait of months between the extraction procedure and the placement of dental implants. This allowed time for the bone that formerly supported your teeth to heal before the implant procedure. These days, however, implants can sometimes be placed immediately into the tooth sockets after tooth removal. In the right circumstances, this has some definite advantages — the major one being that you will need just one surgical procedure rather than two. Preplanning is the key to success with immediate implants. The first step is taking x-rays to determine the quality (volume and density) of the bone that surrounds your failing teeth. Bone quality is a crucial consideration because it determines how well the implant will fuse in place as the surgical site heals in the months following the surgery. If you do not have enough bone there, placing an implant could compromise the healing of the implant-bone interface, and create possible aesthetic or functional problems. If radiographic (x-ray) examination reveals that there is not enough bone to support the implant initially, it doesn't mean you can't have a dental implant; it just means that you will probably need to have a routine bone grafting procedure as the tooth is removed, and then allow the area to heal for several months before having a second procedure to place the implant. Of course, even if your x-ray images look good, it is possible to extract the tooth and then find that placing the implant immediately is not in your best interests due to poor bone quality, inadequate bone quantity or the presence of infection. If that's the case, the implants will be placed after the bone graft heals and enough healthy bone have been generated in that area. After all, implants done right have a higher than 95% success rate, and that is our goal. On the day of your surgery, the area of the tooth or teeth with be numbed with a local anesthetic. If you would like, you can also receive a sedative in pill form or intravenously (through a vein) for a deeper level of relaxation. Tooth extractions rarely require general anesthesia; we will discuss all of these options with you in advance. 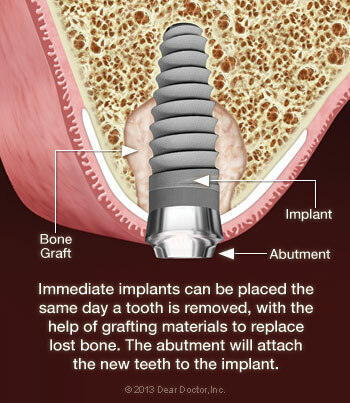 Once the affected tooth is removed, the implant will be placed. A small amount of grafting material may be added to prevent shrinkage of the gum and bone. After the procedure, you may have some minor discomfort and/or swelling in the area, but this should subside in a day or two. If necessary, an antibiotic or pain medication will be prescribed. After the implant is placed, a crucial healing phase begins. Your body will make new bone that actually fuses to the implant, holding it solidly in place. This process, known as osseointegration, usually takes about two to six months. During this time it's important that your implant is not subjected to too much stress. That means you will need to eat a softer diet and keep food away from the surgical site. Depending on how many implants you received and where they are in your mouth, you may be able to receive a temporary dental crown or a set of temporary teeth to wear during this healing phase. That way, you will not only walk out of the dental office with new implants, but possibly new teeth as well! It all depends on your unique situation. As in every circumstance where your health is a concerned, we will do whatever is best to ensure the success of your treatment.